Title : Mégapode la Pérouse. (33.). Map maker : QUOY, Jean R.C. / Joseph P. GAIMARD. Date : Paris, Langlois, 1824. Size : 12.2 x 9.1 inches. / 31.0 x 23.0 cm. 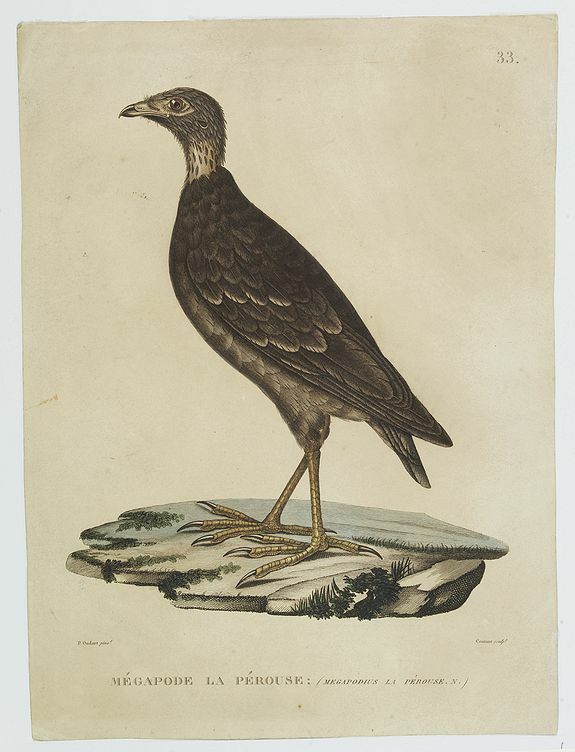 Description :Bird print taken from "Voyage autour du Monde... Zoologie" by Jean R.C. Quoy and Joseph P. Gaimard. The plate is engraved by Coutant after a design by P.Oudart. Condition : Engraving printed in colours and finished by hand. Paper size 31x23cm. Paper slightly age toned.